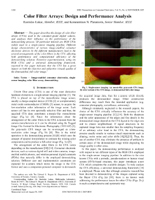 Dr. Lukac has published over 200 research papers on nonlinear filtering and analysis techniques for color image and video processing, camera image processing, microarray image processing, multimedia security, and artificial intelligence in image filter design. Examples are listed below. Find out more in the list of selected publications. R. Lukac (ed. ): Single-Sensor Imaging: Methods and Applications for Digital Cameras, Boca Raton, FL, CRC Press / Taylor & Francis, September 2008. R. Lukac and K.N. Plataniotis (eds. ): Color Image Processing: Methods and Applications, Boca Raton, FL, CRC Press / Taylor & Francis, October 2006. R. Lukac and K.N. Plataniotis: A Taxonomy of Color Image Filtering and Enhancement Solutions. In Advances in Imaging and Electron Physics, (ed.) P.W. Hawkes, Elsevier/Academic Press, vol. 140, pp.187-264, June 2006. R. Lukac, K.N. Plataniotis, and C.N. Yang, Image Secret Sharing. In Encyclopedia of Multimedia, (ed.) B. Furth, Springer-Verlag, pp. 328-335, January 2006. 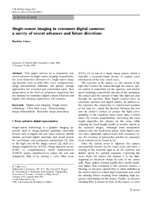 R. Lukac, Single-Sensor Imaging in Consumer Digital Cameras: A Survey of Recent Advances and Future Directions. 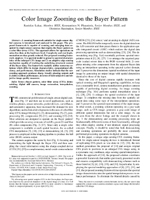 Journal of Real-Time Image Processing, vol. 1, no. 1, pp. 45-52, October 2006. R. Lukac, B. Smolka, K. Martin, K.N. Plataniotis, and A.N. Venetsanopoulos, Vector Filtering for Color Imaging. IEEE Signal Processing Magazine, Special Issue on Color Image Processing, vol. 22, no. 1, pp. 74-86, January 2005. R. Lukac and K.N. Plataniotis, Color Filter Arrays: Design and Performance Analysis. IEEE Transactions on Consumer Electronics, vol. 51, no. 4, pp. 1260-1267, November 2005. R. Lukac, K.N. Plataniotis, and D. Hatzinakos, Color Image Zooming on the Bayer Pattern. IEEE Transactions on Circuits and Systems for Video Technology, vol. 15, no. 11, pp. 1475-1492, November 2005.